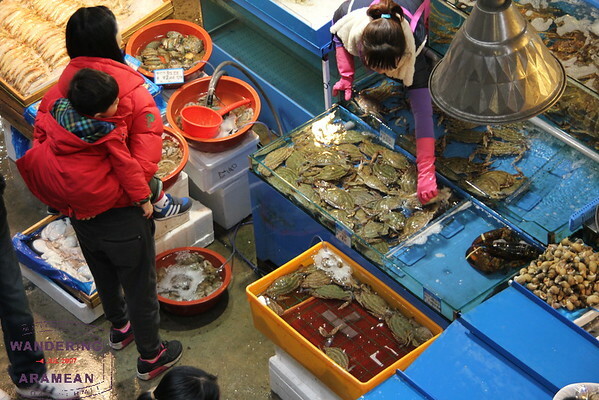 My recent trip to Seoul‘s Noryangjin Fish Market was not the first time I explored the site. I was there in 2009 and enjoyed that experience well enough, I suppose, but it wasn’t the full deal. 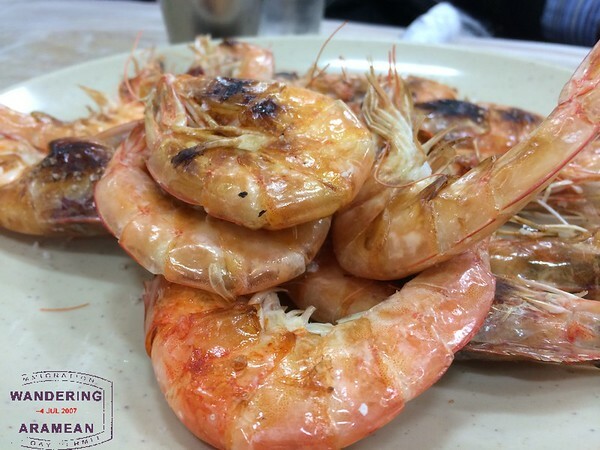 One of the things about the Noryangjin Market is that it offers the option to have your fresh food prepared in a restaurant on-site and consumed right then; it is the ultimate in fresh seafood. And I’ve read plenty of reviews describing the process and the restaurants “upstairs” but most seemed to leave out one or three details which would turn out to be, for me, quite important in figuring things out. Ultimately we were successful in finding the Noryangjin fish market restaurants on this trip, in large part to my stalking a delivery guy from another customer’s order. In the end it was a spectacular brunch. 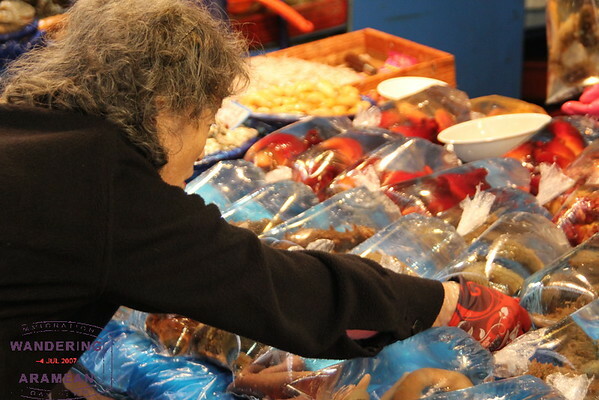 The market itself rivals Tokyo’s Tsukiji for size, selection and a general feel of activity. Tsukiji is a bit more cramped which is both good and bad. At Noryangjin we were able to walk the aisles and peruse the offerings without too much risk of being run over by a forklift or delivery cart. And so we wandered amongst the rows and rows of stalls, moving between sections (most adjacent shops sold similar goods) and generally enjoying the show. And then we decided to figure out how the restaurant part worked. It was not particularly well signed. This group of employees simply set up in the middle of the market for lunch. We chose to visit one of the Noryangjin fish market restaurants instead. Upstairs, along the hallway where visitors arriving by train first enter the building, there are a number of restaurants. But they are not visible on the main hall. Indeed, on that hall all you’ll see are taupe walls. And a couple small spurs leading back into the building without much in the way of activity or signage. These spurs are the key. A second, parallel hallway runs the length of the building “inside” and that’s were all the restaurants are. Also, as it turns out, each of the shops on the ground generally has an arrangement with one of the restaurants upstairs so there is a “runner” nearby when you place an order. He takes your fresh seafood and escorts you up to the restaurant where it will be prepared and served. It took me two trips upstairs to figure this out. The first time I just went up on my own and didn’t head down the unmarked back halls. The second time I followed one of the delivery men and was well rewarded. 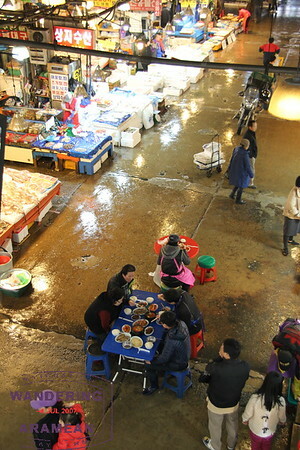 A vendor works over some squid in the Noryangjin fish market. We chose crab and shrimp (we were at one of the shops mostly focused on shellfish) and eventually settled on an order which was entirely too much food. We then headed upstairs, chasing our runner, to settle in on the floor and wonder what was next. Ordering the soju was relatively easy, though the waitress did cut down the volume of our order a bit, probably for the best. Figuring out what was going on with the food was harder, mostly because of total ignorance on our part of the language. Eventually we mard our way through the bottle of soju and the food arrived. The crab was steamed and the shrimp grilled. At this point we proceeded to make an absolute mess of ourselves eating but we were not to be slowed by that fact; it was all fresh and delicious. Plus, there was soju. The kitchen at one of the Noryangjin fish market restaurants. Not sure how to get the hot pot rather than the more simple preparation we received; maybe related to fish versus shellfish?? Stephan and I even recorded part of a Dots, Lines & Destinations episode sitting at the table, discussing the experience in the market and other bits of the Seoul adventures. Fresh sashimi being prepared on the floor of Noryangjin market, for those who do not want to venture up into the restaurants. A trip to Noryangjin Market should absolutely be on a Seoul itinerary; even the shortest of trips should have time to get in and see the market in operation (I did it on a 12 hour layover the first time!) and there’s something to be said for good, fresh seafood. And, if you prefer raw fish to the cooked variety many of the stalls on the market floor sell sashimi platters, all prepared fresh in the market. Indeed, you’re correct. 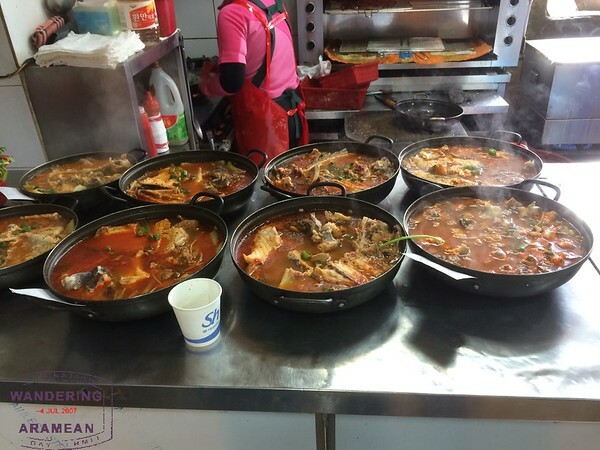 The spicy stew you and your friend spotted at one of the Noryangjin restaurants is for fish. If you purchase any kind of firm white fish (like flounder/monkfish/cod/sea bass/snapper), the spicy stew you saw is the traditional preparation. If you purchase blue crab, they can also be added to the stew. It’s called maeuntang – and soooo delicious! Worth ordering if you make a return trip to Seoul. I was just there in early december. I think I blundered my way into a great meal. Ended up purchasing flounder, which the guy killed and then cut half into sashimi and half for preparation upstairs. I ended up with the spicy fish stew, which was every bit as delicious as it looks. Had a so-so experience here. The live octopus and other seafoods were pretty tasty but the Koreans are definitely not skilled in the sashimi arts. The way our sashimi were sliced made the flesh taste somewhat crunchy vs. what you would expect.